Resource Editor: How to Edit a Menu resource, Captions, Sub-Menus and Menu Items, Optional Shortcut. 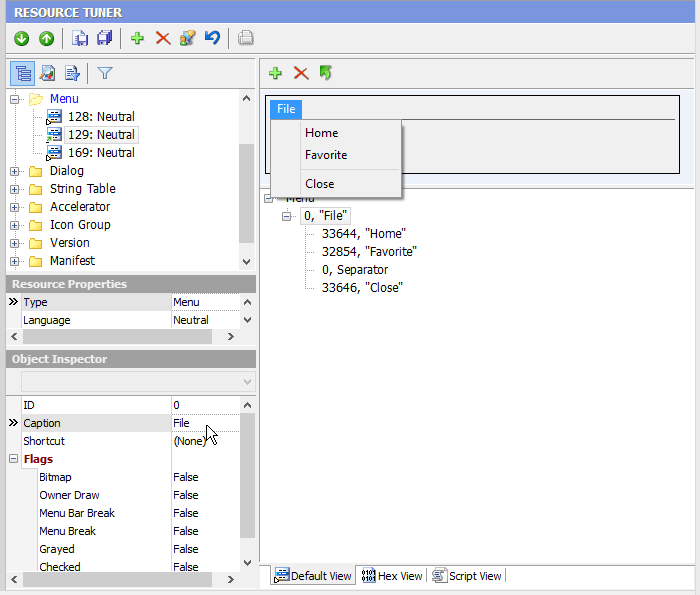 A menu resource stores a tree of sub-menus and menu items that define the appearance and function of an application menu. A menu is a specialized input control that lets the user select commands and submenus from a list of menu items. A menu item has a caption, a menu resource ID, and an optional shortcut. Menu IDs cannot be edited. These values are hard coded into the EXE file. Changing them is likely to cause the modified program to crash.